Sugar and Osteoporosis. There's no mystery to that dynamic. There are a variety of ways/directions in which sugar effects the body poorly. Specifically for the development of osteoporosis, each and every one of those ways plays a role. Possibly one or two are primary causative factors, but it is important to note that ALL the factors are hurting bone density. Sugar is tasty. We like sugar. But too much of it too often (daily) helps cause all sorts of disease and dysfunction in the human body. As a general statement, sugar is bad for the human body. More specifically, processed sugar is bad for the body. But so is too much fruit sugars. High fructose corn syrup, one of the many modern health killers in today's food industry, has been shown by various research studies to have an nearly identical effect on the body as 'sugar'. How Is Sugar Bad For Health? We could definitely talk more about how bad sugar and high fructose corn syrup are for the body, but we're here to talk about sugar and osteoporosis. Osteoporosis is caused by calcium being pulled from bones, leaving them weak/weaker/weakened. 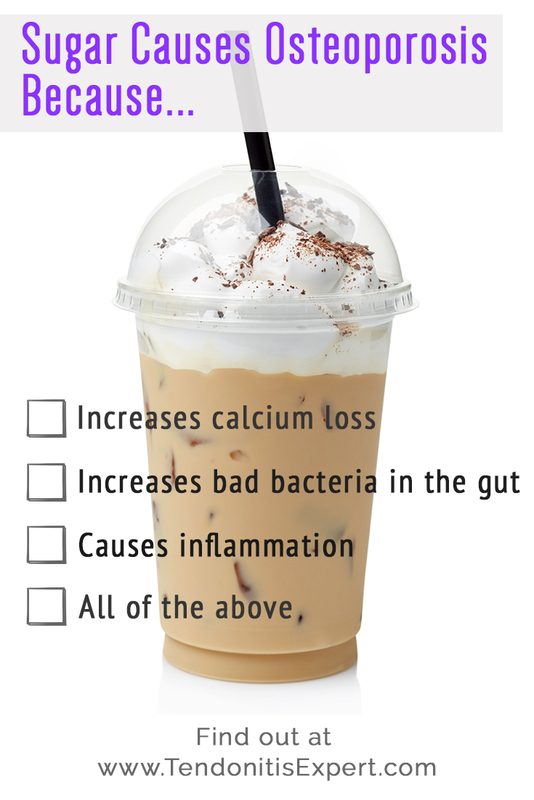 Sugar causes increased urinary excretion of calcium. So there's less in your system and the body replaces it with calcium from your bones. So we lose calcium with every mouthful of sugar. And not having enough usable calcium means the body will pull calcium from bones. Every bite of sugar you take in is replacing a bite of nutrition-filled food. Sugar has calories but no nutrition. Estimates are that 20% of dietary intake of the US population is sugar. So right off the bat we're taking in 20% LESS NUTRITION. Nutrition that our body needs to function. So we lose calcium and other vitamins and minerals by not actually putting it into our bodies as we eat sugar instead. See the Vitamin D Osteoporosis connection. Without enough available usable calcium (and other necessary nutrients needed to utilize the calcium there is) the body pulls that calcium from bones and teeth. Sugar causes bacterial overgrowth in your gut. The bad kind, not the good kind. That bacterial overgrowth eats up nutrition that should be going to you but now can't. And bacterial overgrowth causes inflammation and excess 'toxin' buildup which forces the body to use nutrition (like magnesium and B vitamins) as it attempts to deal with those problems. Without enough magnesium, the body can't utilize the calcium coming in very well so it will pull the needed calcium from bones and teeth. There must be a correct ratio of phosphorus to calcium or a 'wrong' form of calcium will result that eventually forms stones in teh gallbladder, liver, and kidneys. Sugar gets rid of stored up phosphorus, and then the body doesn't have enough to use. Then the body senses a need for good calcium so it pulls is from the bones. Sugar causes inflammation. Inflammation Causes Vitamin B6 Deficiency and other nutritional demands, stealing it from being available to the mechanisms necessary for strong bones. Ultimately, your body doesn't have access to nutrition it needs to function properly, and it ends up removing calcium from your bones. Your bones get weaker and weaker over time. And all of that is caused by tasty, nutritionless sugar. Sugar and Osteoporosis go hand in hand. Stop eating sugar. Or lower your sugar intake drastically. Less to no sugar, less to no high fructose corn syrup, less to no processed foods. You might not feel bad right now, but sugar is a health killer, and sooner or later, you'll notice the heart disease, or diabetes, or excess fat on our body, or a hundred other possible health issues that cause suffering. Do you want a lifetime of health or a moment of sweetness that leads to pain and suffering? You are the lion with a thorn in it's paw. This thorn will slowly kill you, painfully, over time. And only you can pull the thorn out. Return to the top of this Sugar And Osteoporosis page.